Can you believe that drop off day at Camp Shohola is only a few months away?! That makes this the perfect time to start packing for our sleepaway camp in Pennsylvania. We recommend starting packing about a month in advance; this gives you enough time to gather any items that you might have forgotten about. Now, we understand that packing for summer camp can be a really stressful and annoying process, but here at Camp Shohola, we are here to help. Follow these tips when packing for summer camp this summer. Invest in a trunk. Before you start packing everything, consider buying a trunk. Look for one that is strong enough to last for multiple years at summer camp. Next, if you want, customize the trunk! Cover it in stickers, vinyl, tape some photos, anything to make it more personalized. Start to actually pack. Follow our summer camp packing list to ensure that you have everything you will need this summer. This list includes the items that are obvious as well as ones that you may not think of. Include any equipment that your son will need for our summer camp activities. While our summer camp facilitieshave a lot of equipment, campers may want to bring their own. This includes fishing rods, cleats, racquets, gloves, and any other equipment that your son might need to participate this summer. Don’t forget some kind of shower tote or caddy. This will be extremely useful when it comes to carrying toiletries to and from the bathrooms. It will also ensure that they won’t forget or lose anything! Label EVERYTHING! All clothing and other articles have to have the camper’s name written or labeled on it. Many of our camper’s parents recommend using a laundry marker or waterproof labels. Pack liquids in a plastic Ziploc bag for transporting it to summer camp. No one wants shampoo and conditioner all over their clothes! Everyone feels a little homesick at summer camp. To try and ease the homesickness, include some photographs, stuffed animals, special blanket, or anything that will remind them of home. Also include some kind of stationary, pens, and stamps for campers to write home with! Now, start packing! 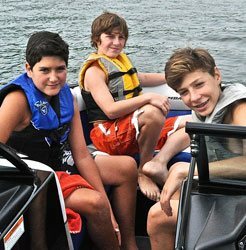 If you’re looking for the best sleepaway camp in Pennsylvania for your son, consider Camp Shohola, we still have room for this summer! Call us at 570-371-4760 for more information or to schedule a tour today!